What is the best beer to cook with? As recipe creators for a blog with a strong cooking with beer bias we are asked this very question all the time. Especially Chris. And as you can imagine, there isn’t a singular, clear cut answer to it. At the same time based on our many years of combined experience we have plenty to say. TIP: We’ve organized the ‘best beer for’ answers by topic – as dictated by the relevant questions most often posed to us. Scroll down and scan the subheadings to find what interests you. Beer is the single most diverse beverage in the world. It is both fascinating and mind boggling to consider all the flavors that can arise by the interaction of water, malts, hops and yeast alone. Throw in adjuncts, spontaneous fermentation, aging in barrels that previously housed various spirits and there are virtually no limits to the possibilities of creating culinary pleasures using craft beer. The most important ones are carbonation, balance and the ability to take on flavors from adjuncts such as fruit, herbs, spices. When we recommend a style without any additional descriptors consider that to mean a middle of the road, standard representative of the style without anything too creative done to it. Besides beer can chicken, there are numerous ways to use beer in chicken dishes. Growing up my family frequently enjoyed a pan roasted chicken with a delicious butter, garlic and German pilsner sauce. 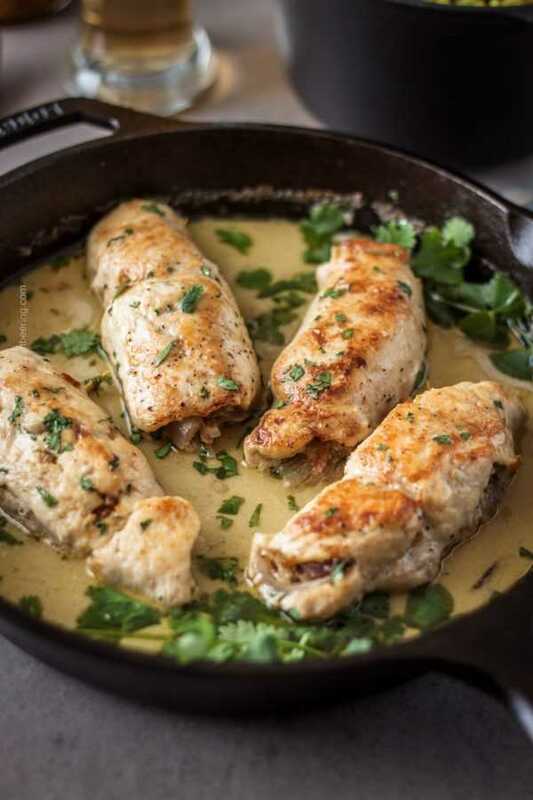 Traditionally brewed pilsners (both Czech and German) with their gorgeous Noble hops herbal notes are frequently our go to choice when we cook chicken – from braised chicken thighs to chicken breasts simmered in quick pan sauces. If you want to cook a couple of boneless chicken thighs in a skillet with some honey and garlic – an American blonde ale or a honey wheat ale will make a formidable addition as the liquid. Belgian wits are also a favorite choice of ours with their coriander, orange and spice notes and mix very well with coconut milk (Vindaloo Witbier Chicken Roulades). Fruit flavored beer options even though uncommon can elevate a chicken recipe to unsuspected heights. For example my Peach Ale Sticky Chicken is not exactly a chicken dish with a standard flavor profile, yet it is incredibly delicious and really fun to make. 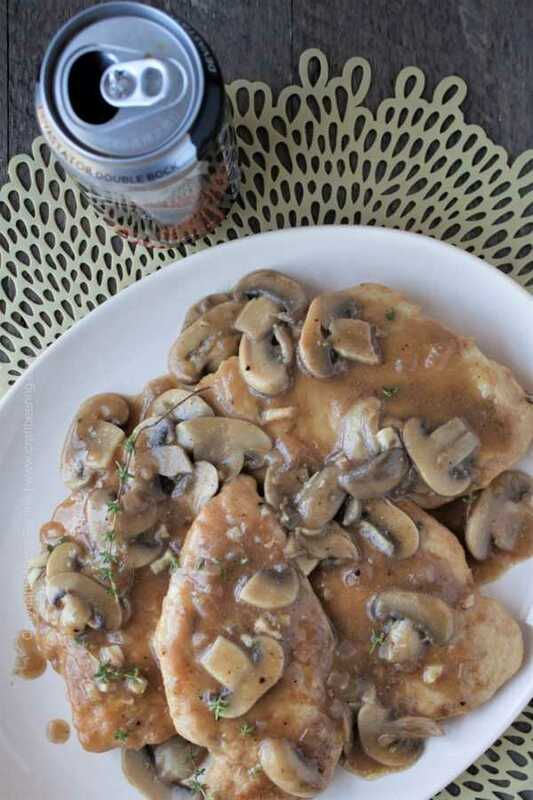 Our most favorite chicken recipe ever (our original) is this Chicken Beersala with doppelbock. Flavor wise it truly is the crown jewel of cooking chicken with beer. 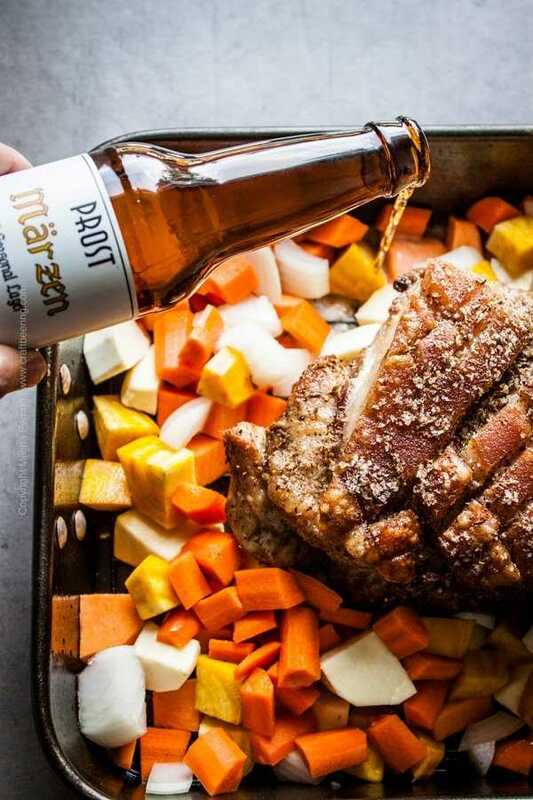 Pork eagerly lends itself to cooking with beer. For pork roasts we recommend malty and spiced lagers and ales such as seasonal Marzens (Oktoberfest lagers), amber ales and lagers; bocks and doppelbocks and also seasonal Christmas/holiday ales and lagers which are frequently spiced similarly to Marzens. These two recipes will never let you down – Boneless Pork Shoulder Roast (Schweinebraten) and Roasted Pork Hocks (Schweinshaxe). To marinate pork with beer – use Vienna lagers or amber ales. The results are always most favorable. For example, we add Vienna lager to the marinade for Tacos al Pastor. It lends it gorgeous roasty, malty notes and helps balance the rest of the flavors in the marinade. To cook pork and cabbage with beer (including sauerkraut like this Choucroute Garnie) we favor amber lagers or ales, brown ales and Munich helles. There is a lot of fun to be had cooking pork with beer! 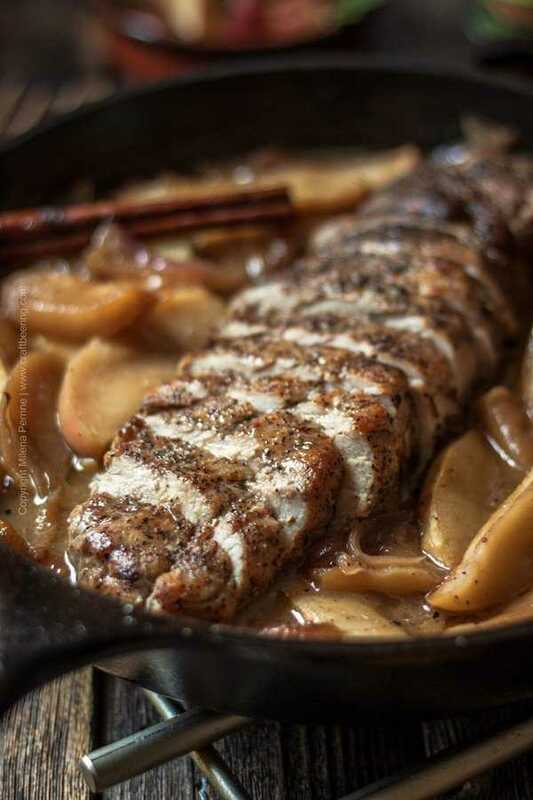 Check out this recipe for Apple Pork Tenderloin where we use a pumpkin ale. Should you want to prepare it without the apples but with more onions and very thinly sliced potatoes, beets or turnips, a porter or a malty brown ale will be perfect. Pilsners work beautifully in pork meatballs, both the flavor and the texture (due to the carbonation) of the meatballs benefit from the addition. 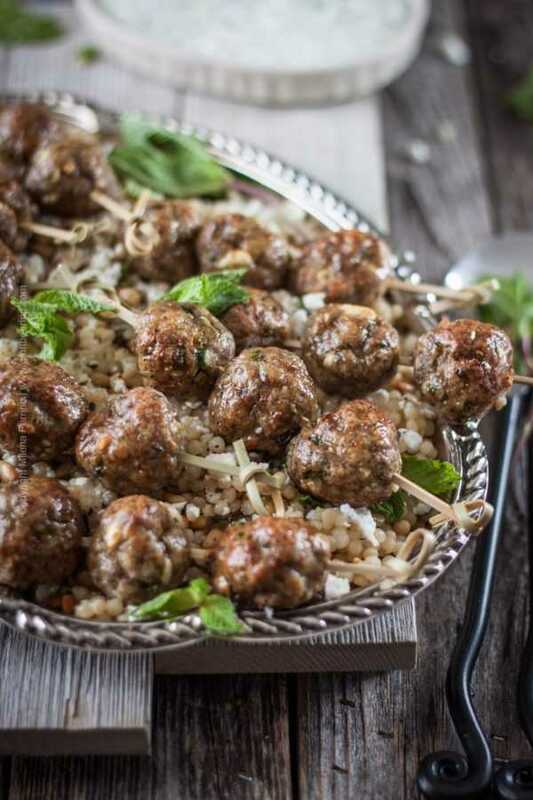 You can modify this Lamb Meatballs with Pilsner recipe and use ground pork. I still need to publish my grandmother’s Grilled Pork Kuftes recipe using Pilsner. Favorite of Chris’. 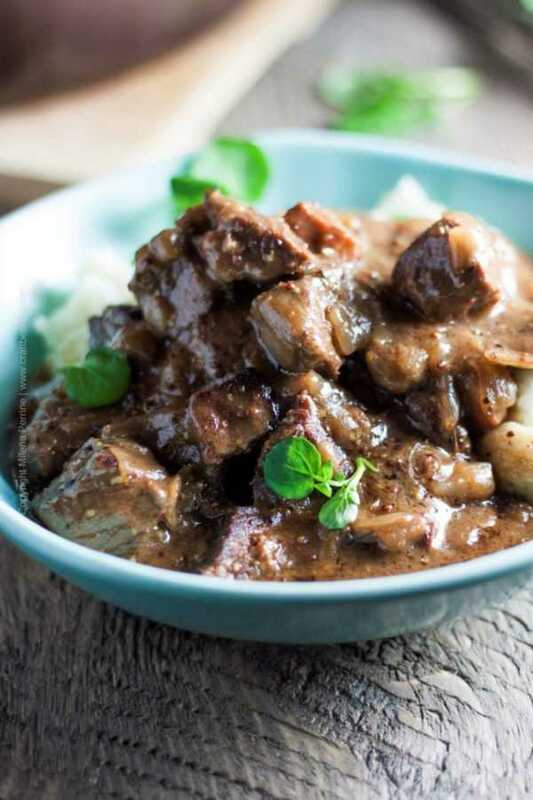 Any time you want to braise beef consider stout, porter, schwarzbier, bock or doppelbock, Vienna lager. Beer Braised Beef Short Ribs benefit from the robust roasty presence of a porter or a stout. And if you like sweet and sour beef stew such as the marvelous Carbonnade a la Flamande you simply must use strong Belgian ales such as Belgian dubbel and add some mustard. Bock and doppelbock lagers are excellent choices to include in beef dishes as are many Belgian ales. 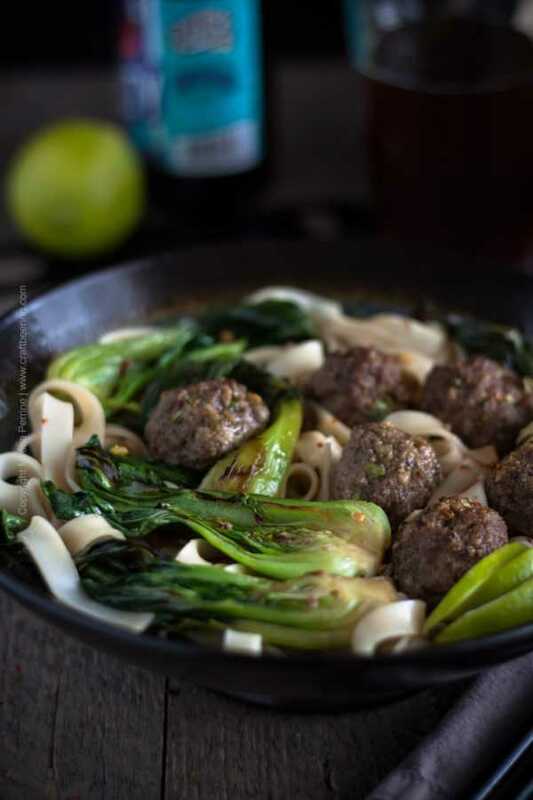 Bock braised beef meatballs and baby bok choy. Bowl of beer turkey chili with Belgian farmhouse ale (saison) and charred tortillas. When making beer beef chili your best bet is a stout or porter for the roasty notes and malty backbone. We love to use chocolate stouts – considering that chili usually calls for cocoa powder they make perfect sense. But certain other styles such as schwarzbier and dunkel lagers, brown ales or intense amber ales have their merits too. For a lighter Turkey Chili our top choice is saison, followed by amber ale. 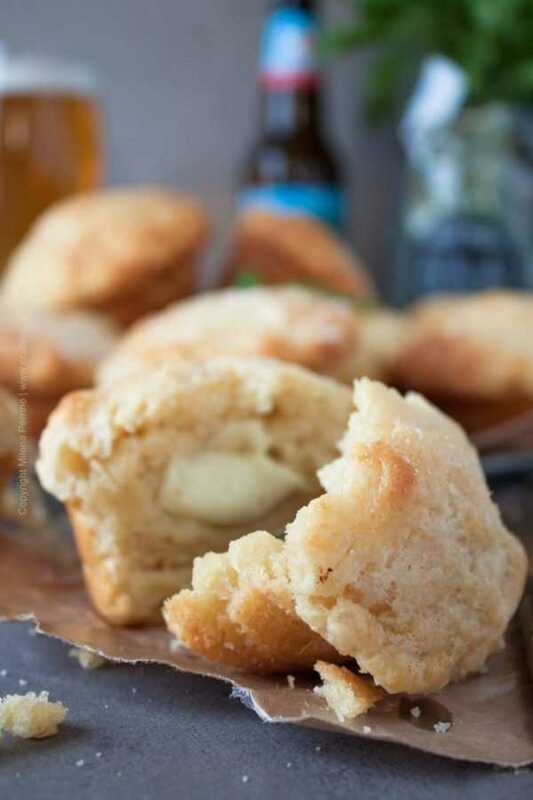 Buttery beer muffins stuffed with mozzarella cheese. Mmmm. For baked goods such as cupcakes, biscuits, muffins, rolls, bread we tend to gravitate towards beers with wheat in the grain bill such as hefeweizen, Belgian wits, American wheat ales. But then again, it all depends on what is being baked. Dark ales and lagers usually add deeper flavor to beer bread – case in point this Cheesy Porter Beer Bread. Fruit flavored beers also make great contenders – check our this Raspberry Ale Bread, Peach Ale Breakfast Loaf, Pumpkin Ale Bread, Dunkelweizen Banana Bread, Bourbon Cherry Ale Croissant French Toast. And if you are craving a beer chocolate cake – stout, porter, brown ale, Munich dunkel will all serve you well. 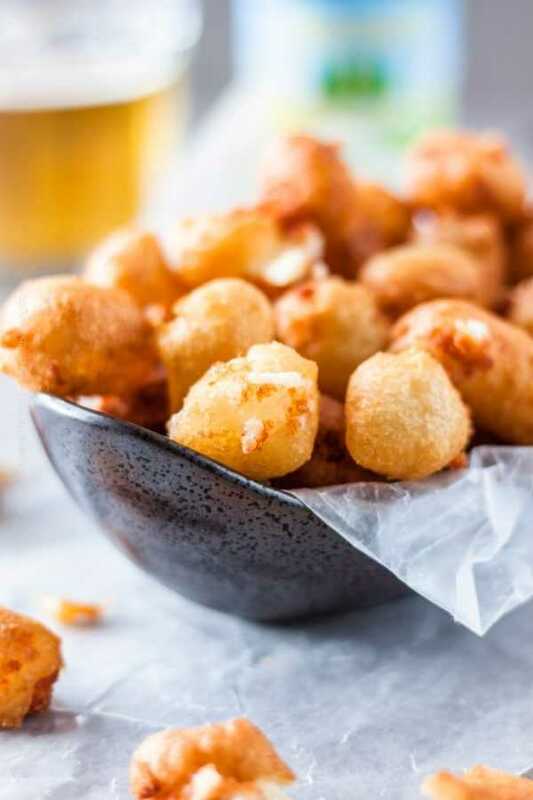 Beer battered fried cheese curds. The more carbonated the beer you use the better the batter will turn out. Our favorite styles to use in beer batters (for frying) are highly effervescent wheat ales and American lagers, but also pale ales, pretty much all the German lagers, stouts and porters. The more flavor in addition to carbonation, the better. Along these lines we also strongly favor amber ales and brown ales. This applies to batters for frying cheese curds, veggies such as cauliflower or green onions (yum), oysters, fish and chips, shrimp, chicken strips, hush puppies. If you’re making batters for fritters, pancakes or crepes then there is really no limit to what you can do. 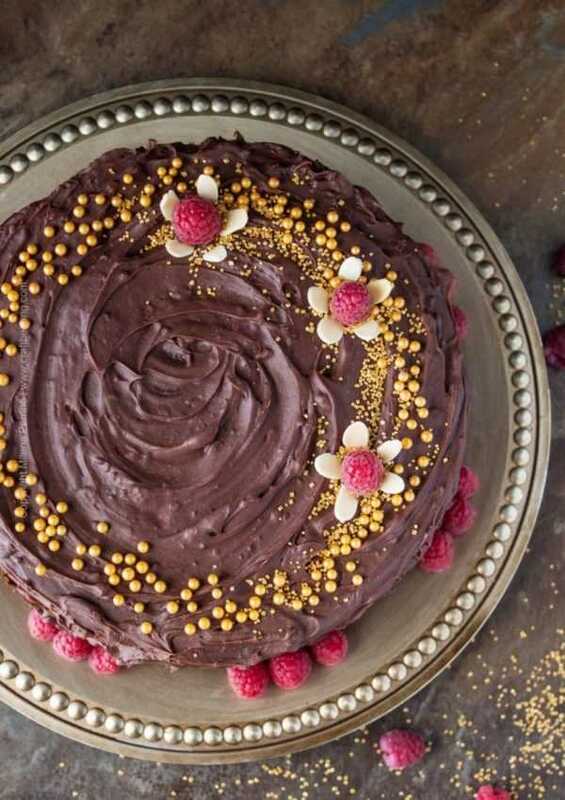 Just go ahead and subscribe to our mail list so we can send you recipes every two weeks. We constantly add new ones in addition to those already living on Cooking with Craft Beer. 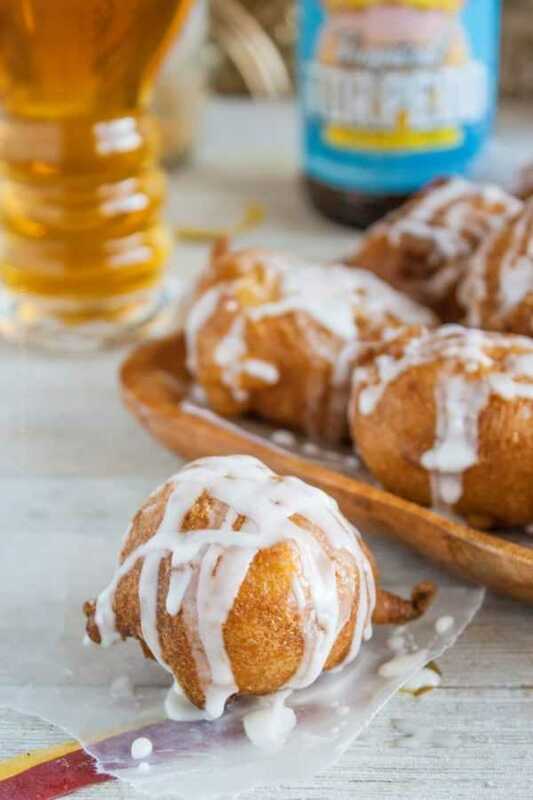 We love to use IPA with tropical fruit notes to make these Mango Fritters, Hefeweizen to make Crepes with Lemon and Bluberries Whipped Ricotta, coconut porter for Coconut Pancakes .. and so on. Peach ale fritters with fresh peach chunks are on our list to add to our blog. 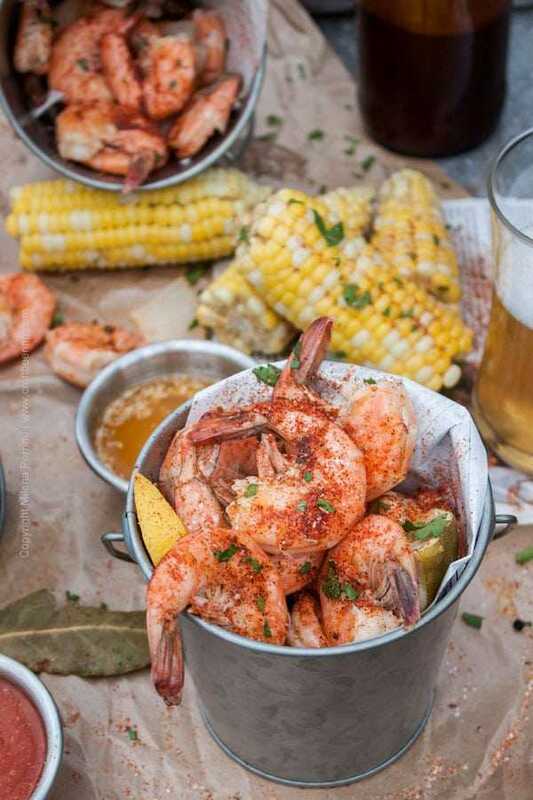 For steaming or boiling shrimp or crab we love citrusy IPAs, pale ales, but also wheat ales such as Gose or witbier. Juicy IPA Peel’n’Eat Shrimp (above) and Witbier and Coconut Milk Steamed Mussels (below) are among our favorites. Then there are the possibilities offered by saisons, Belgian golden ales, Belgian tripels. Clams, mussels, scallops – all of them agree with the Belgian beer styles. Here it depends on what you are aiming to do. You can (and it will taste great) use beer to marinate fresh raw fish and essentially ‘cook it in the acid’ in a similar way that you’d use citrus juice. So if you are thinking a ceviche of some sort we most enthusiastically recommend lacto sours (aka kettle sours) such as gose and Berliner Weisse. For fish batters see above section on batters for deep frying. We have several cooking with beer fish recipes coming up using Belgian styles. So check back soon. More specifically the two sub-questions we get asked are: What is the best light beer to cook with? and What is the best dark beer to cook with? The best beer to use depends on what you want to make. Drink more beer. Try different styles, take note of their aromas, flavors, mouthfeel. Learn about how different styles are made. The best beer style to cook with is probably saison. It is certainly the most food friendly beer style to pair with food, but then again, saison (aka farmhouse ale) is a catch all category for so many ale variations, grain bills, adjuncts. What makes saisons suitable for cooking are their low bitterness, great flavors and carbonation. When in doubt, use a saison. This is a question we somewhat dislike and we always answer it the same way – style and execution are more important than brand. It only makes sense. This is so interesting and it makes me realize I don’t bake (or cook!) with beer nearly enough. I think I need to change that next year!